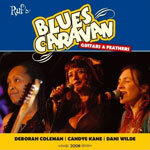 CD review: "Ruf's Blues Caravan: Guitars & Feathers"
While Oceanside's blues diva Candye Kane didn't release a new studio album in '08 (she was otherwise occupied in kicking a bout of cancer), she was part of a live set issued by her label, German's Ruf Records. Recorded while Kane was on tour with fellow contemporary blues singers Deborah Coleman and Dani Wilde last year, the album showcases all three women  although Kane gets more than half the featured vocals (as well as both the opening and closing tracks). What's interesting about the shows is that Coleman and Wilde are as well known as guitarists as they are singers, while Kane is strictly a singer on stage. That might explain the stylistic differences between Kane and the other two  Coleman and Wilde both play a rock-blues hybrid, giving them plenty of solo time on guitar. But if they're closer to Bonnie Raitt or Stevie Ray Vaughan than they are to the high blues of Bessie Smith or the southside Chicago blues of Koko Taylor, Kane is the purest heir to Taylor's title of Queen of the Blues. Kane's over-the-top approach to the blues takes Smith's operatic approach and Taylor's larger-than-life energy, and infuses the mix with Jimmy Rushing's blues shouting and a huge dollop of 1960s' blue-eyed psychedelic blues a la Janis Joplin and Tracy Nelson. The mix on this live set is fairly clean (although muddier than her studio albums), the energy from the three singers and the band is sky-high, and the audience is appreciative.